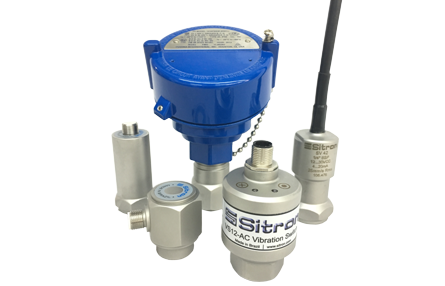 The SV42 is a compact and robust vibration sensor used to monitor and detect misalignment or imbalance in motors, fans, centrifuges, compressors, generators and other machinery. Widely used in industrial applications, the SV42 is a key part of any plants preventive maintenance plan. The sensor measures the mechanical vibration speed in a range of 10, 25 and 50 mm/s rms on non-rotating surface and converts it to signal 4…20mA (2-wire) proportional with great precision and stability even when applied to large equipment . The SV42 can be installed with a threaded fixed base or magnetic base (recommended when you need to remove or easily move the sensor).